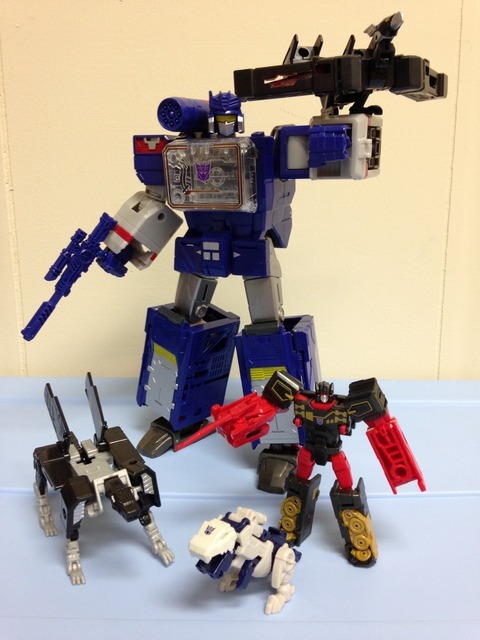 Decepticon Rumble is part of a team of Decepticon spies led by Soundwave. A demolitions expert who often speaks in rhyme, Decepticon Rumble is a trash-talking, Autobot-stalking brawler. Though he's small in size, he's capable of bringing down huge targets by transmitting low-frequency ground waves that create powerful earthquakes. Rumble falls in with fellow Titans Return data pads Ravage, Laserbeak, and Buzzsaw, all of which are minions of the Leader Class figure Soundwave. Rumble, like the other figures mentioned (save for Buzzsaw) has been around since the Generation 1 cartoon series and toy line, with a fairly deep history from way back when (which I won’t detail here). On the toy side of things, Rumble has had quite a few renditions over the years, in which he was either red or blue, depending on Hasbro’s or Takara’s feeling for the day, or who printed the box; heaven forbid they ever make a purple one to split the difference. The confusion was mirrored in the original show, and for the longest time no one knew who was what color between Rumble and Frenzy. There are contingencies of people who fall into one belief system or another on who is who, with fancy acronyms to boot (FIRRIB and RIRFIB. Seriously, look it up. It’s kind of funny.). I fall squarely into the ‘I don’t care either way’ category, though I suppose I lean more for Rumble to be red, and likewise Frenzy to be blue. 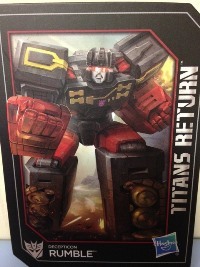 Hasbro still takes the scattered approach, with Fall of Cybertron and Prime Rumble as blue, and yet this version is red. It could be quite maddening if you have OCD! Rumble’s (primary?) alternate mode is that of a data pad/tablet of non-descript design. 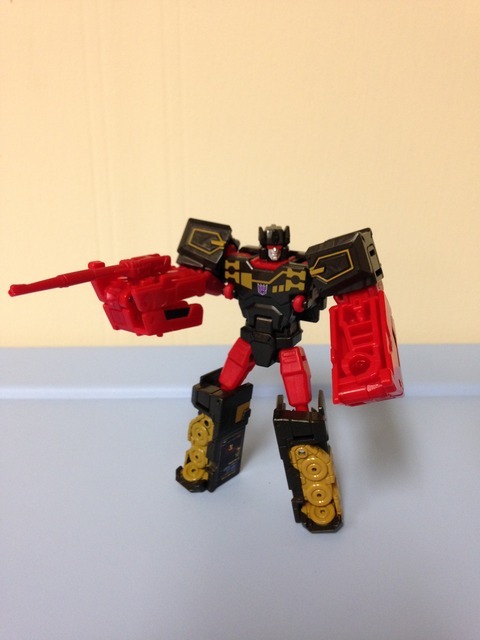 The alternate mode isn’t much more of a block, made in dark grey/black with red sides. A tiny ‘screen’ is featured in the middle, detailed with a bunch of little readouts mostly dealing with seismic activity and what not. The detailing on the stickers is done rather well, though they’re a bit dark and are hard to read in dim lighting. 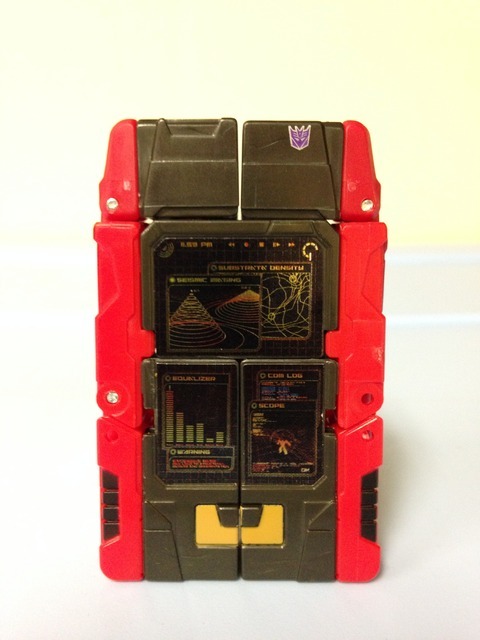 The top corner features a tiny Decepticon symbol, and on the bottom of the data pad mode you’ll find a ‘functioning’ 3.5 mm plug that you can put a pair of headphones into. Sure, it doesn’t actually work, but it’s neat nonetheless. Mostly, the data pad mode acts just like it needs to: no moving parts, and sits there like a brick. Woohoo! 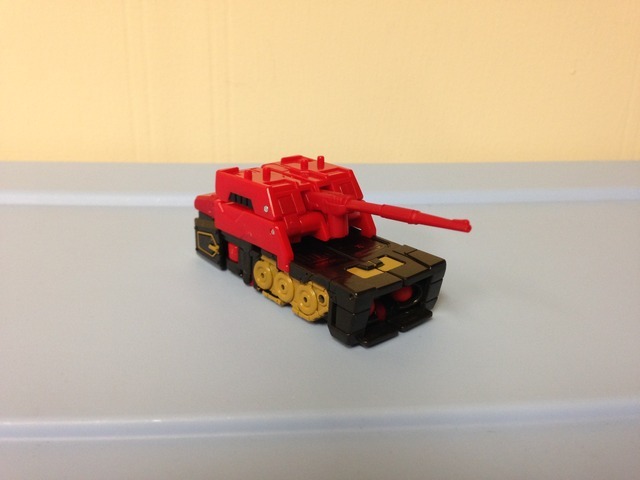 One of the more well done alternate modes for the data pads, Rumble can also turn into a tank. It’s pretty boxy (and also non-descript), but it features a small turret and some tiny rolling wheels. The turret doesn’t move at all, but the barrel has a tiny bit of wiggle to it. On a flat surface, at least the wheels roll well. The top of the tank features two spots side-by-side for Titan Masters to ride on too, so a bit of fun can be found while scooting him around. While the tank mode is nothing amazing, it’s far superior to Ravage’s jet mode and Laserbeak/Buzzsaw’s vehicle modes, in my opinion; ultimately, this mode doesn’t do anything to hurt the rest of the figure. Rumble’s robot mode, on the other hand, is a blast. He’s tiny, decently balanced, has good articulation, and comes with a blaster rifle. As a repaint of Rewind, you won’t find any surprises with Rumble, but you will find a new head. It’s a nice little mold with good detailing and sharp paint apps, making the face clear to see. The rest of the body is a good blend of both red and black, with a muted gold detailing here and there. The molded detail all around is done well, and Rumble’s proportions are good too – he’s got some bulky/boxy arms, slightly thin torso, and appropriately sized legs. I don’t know what it is about the robot mode, but I feel like he just popped out of Soundwave’s chest a few seconds ago and is ready to bring some destruction! The one feature that is sort of missing is Rumble’s pile driver arms, but this can be somewhat addressed by flipping out the underside of the forearms and spinning the arms backwards. It’s not the greatest by any means, but it’s better than not having the option at all. Rumble also comes with the aforementioned blaster rifle, which to be honest is rather boring. It’s thin and not detailed, but least he comes with something to wield, which is a feature most Legends class figures don’t have. Transformation Design: 7/10. There’s nothing super tricky here, but Rumble is fun to fiddle with between the three modes, and he folds up rather nicely into data pad mode. Durability: 8/10. Pretty rock solid. Anything that actually pops off can be snapped right back into place, and I can’t think of any spots that he will break. Fun: 9/10. Rumble is the best of the data pads I own. He’s a jot to fiddle with, has great articulation, a weapon, and three pretty decent modes. If you have a Soundwave too, you’ll find more fun than what’s included in the base package. Aesthetics: 7/10. The tank mode could look better, but the data pad and robot modes are pretty good. Real pile driver arms would have looked great. Articulation: 8/10. For a little guy, he’s got movement where it counts. Nothing is hindered, and he balances decently. His feet are a tiny bit on the small side, so that can hurt some poses, but that doesn’t affect his articulation. Value/Price: 8/10. Rumble is fairly cheap at $10 USD. As an add-on to Soundwave, I would say he’s pretty much a must-have. On his own, he’s still really fun from a lot of aspects, so I think you’d be good either way. Overall: 8/10. There really isn’t anything I truly dislike about Rumble. He’s not perfect, but he’s loads of fun and pairs really well with Soundwave. Rumble is easily the best data pad figure of the bunch, and can even hold his own without Soundwave. For the cost, I think he’s a worthwhile pickup. Here’s to hoping Hasbro makes a Frenzy to go with him!! !